John Aron Toews: teacher, minister and conference leader; born 15 August 1912 in Rückenau, Molotschna Mennonite Settlement, South Russia, the third of four children of Aron A. Toews (9 January 1884 – 5 November 1969) and Agnes (Harms) Toews (25 December 1886 – 15 March 1978). In 1935 John married Aganeta "Nettie" Willms (11 July 1911, Hierschau, Molotschna, South Russia – 29 March 2001, Abbotsford, British Columbia, Canada) in Namaka, Alberta. Nettie was the daughter of Johann G. Willms (28 July 1865 – 25 April 1914) and Gertrude (Plett) Willms (5 April 1867 – 8 August 1924). John and Nettie had five children: Elfrieda, Wilma, John, Irene and David. John died 13 January 1979 in Winnipeg, Manitoba. 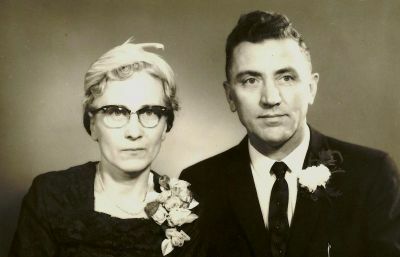 John’s family fled the Soviet Union in 1926 and settled in Namaka, Alberta. Later, Toews attended a variety of institutions including the Coaldale Bible Institute, the Prophetic Bible Institute led by William Aberhard, Tabor College (BTh, 1940), and the University of Minnesota (PhD, 1964). Most of Toews' life was spent in a teaching career, especially at the Mennonite Brethren Bible College (1947-1967; 1976-1979) where he served as president for seven years (1956-1963). He also taught at Trinity Western College in British Columbia, served three years in a pastoral ministry in British Columbia, and spent shorter periods of teaching and ministry in Europe and South America. He served his denomination in a variety of committees and leadership roles and at the time of his death was moderator of the General Conference of Mennonite Brethren Churches. Toews had a special concern for cooperation with other Mennonite bodies, which was expressed by active involvement in the Mennonite World Conference, Mennonite Central Committee, and in other activities. He was the author of a number of books and numerous articles, many of which focused on Anabaptist and Mennonite concerns, including a definitive history of his own denomination (1975). He was probably the most effective interpreter and spokesman for the Anabaptist vision in the Mennonite Brethren Church in his generation. Toews, John A. People of the Way: Selected Essays and Addresses by John A. Toews, ed. by Abe J. Dueck, Herbert Giesbrecht, and Allen R. Guenther. Winnipeg: Historical Committee of the Board of Higher Education, Canadian Conference of Mennonite Brethren Churches, 1981. Toews, John A. A History of the Mennonite Brethren Church: Pilgrims and Pioneers, ed. by A. J. Klassen. Fresno, CA: Mennonite Brethren Board of Christian Literature, 1975. Available in full electronic text at: https://archive.org/details/AHistoryOfTheMennoniteBrethrenChurch. Toews, John A. True Nonresistance through Christ: A Study of Biblical Principles. Winnipeg: Mennonite Brethren Board of General Welfare and Public Relations, 1955. Dueck, Abe J. and Richard D. Thiessen. "Toews, John A. (1912-1979)." Global Anabaptist Mennonite Encyclopedia Online. December 2005. Web. 20 Apr 2019. http://gameo.org/index.php?title=Toews,_John_A._(1912-1979)&oldid=163486. Dueck, Abe J. and Richard D. Thiessen. (December 2005). Toews, John A. (1912-1979). Global Anabaptist Mennonite Encyclopedia Online. Retrieved 20 April 2019, from http://gameo.org/index.php?title=Toews,_John_A._(1912-1979)&oldid=163486. Adapted by permission of Herald Press, Harrisonburg, Virginia, from Mennonite Encyclopedia, Vol. 5, p. 886. All rights reserved. This page was last modified on 10 March 2019, at 01:00.